Thanks for your participation this year and we are looking forward to your participation next year. Register to our Newsletter and follow us on the Social Media (Facebook, Twitter, LinkedIn and YouTube) to receive regular updates about the Weighing Industry and the next edition of the Weighing Review Awards. Here are the Weighing Review Readers’ Choice Awards 2016 WINNERS. Congratulations! METTLER TOLEDO is a global manufacturer and marketer of precision instruments for use in laboratory, industrial and food retailing applications. The Company has strong worldwide leadership positions. A significant majority of our instrument sales are in segments in which we are the global leader. In addition to a broad product offering, we have one of the largest global sales and service organizations among precision instrument companies. We focus on the high value-added segments of our markets by providing innovative instruments that often integrate various technologies including application-specific solutions for customers. We design our instruments not only to gather valuable data but also to facilitate the processing and transfer of this data into customers' management information systems. Sartorius Intec is a part of the Minebea Group, which is the world’s leading comprehensive manufacturer of high precision ball bearings and components also a provider of innovative and high quality precision technologies. The company offers a comprehensive portfolio of products and solutions across the manufacturing process of our customers, from goods-in to goods-out, from platform scales to process vessel and silo scales to checkweighers and foreign body detection equipment as well as software solutions. Its strong R&D capabilities, including software development, have resulted in technology leading positions in several product segments. Sartorius Intec’s global sales, service and manufacturing footprint, provide our customers with the best possible service and support around the world. Siemens offers a comprehensive range of products and systems for weighing and batching technologies – first-class solutions that help you solve almost any weighing task in a perfect way: including belt weighing systems, weighfeeders, container scales, even batching systems. Whatever the industry, our weighing technology makes a decisive contribution toward meeting quality, cost and deadline targets. METTLER TOLEDO (Switzerland) - METTLER TOLEDO has launched a new generation of balances with 1 mg readability that can be operated without draft shield on an open bench. Compared to state-of-the-art standard balances (with standard solid weighing pan and draft shield) the XPE three place balance with innovative SmartPanTM weighing pan delivers in most of the working conditions results up to twice as fast with an outstanding repeatability. The innovative SmartPanTM weighing pan is specifically optimized to minimize the disruptive effect of air drafts. Furthermore the elimination of the draft shield enables quicker and easier weighing processes with a significant impact on user comfort and productivity. 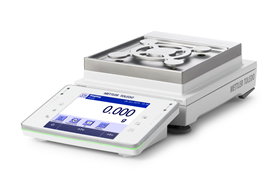 The new XPE precision balances adopt additional and noticeable features such as the StatusLightTM on the weighing terminal indicating to the user that the balance is ready for weighing and the digital LevelGuideTM which notifies the user of the leveling status of the balance. XPE Precision balances also feature the optional ErgoStandTM, which reduces the overall balance footprint whilst providing an ergonomic alternative to the neck-strain risk associated with repetitive weighing. 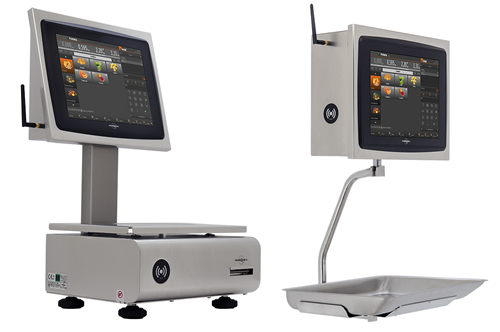 Balanças Marques (Portugal) - The BM5 XS is a scale with touch screen that combines all the desired features for the retail sector: competitive price, small size, reliability, high performance and design. The BM5 XS gathers hardware and software of excellence and is equipped with the latest technology. The high performance of the BM5 XS is guaranteed by ARM processors of latest generation and a motherboard fully developed and produced by Balanças Marques. The 12.1" LCD touch screen, with projected capacitive technology, ensures speed and efficiency in customer service. The BM5 XS has a new version of the certified billing software, ETPOS 5, which mantains the features of previous versions - simple, intuitive and functional - and presents a completely renewed interface that greatly enhances the user experience. The integration of ETPOS makes the BM5 XS a device with integrated management capability that emits any type of legal documents. Available in two models – Double Body and Suspension - the BM5 XS is a scalable, configurable and expandable solution, allowing a greater return on investment in this equipment. Siemens (Germany) - The two time best industrial scale award winner; Siemens Milltronics MSI is a heavy-duty, high accuracy, full-frame single idler belt scale that provides continuous in-line weighing on a variety of products in primary and secondary industries. It is proven in a wide range of tough applications from extraction (in mines, quarries and pits), to power generation, iron and steel, food processing and chemicals. With more approvals than any other belt scale in the world and the patented original triple beam parallelogram load cells, the MSI has proven itself successful around the globe. Combined with a WT241, full feature stand alone BW500 or a SIMATIC integrated WP241, the MSI can provide un-paralleled performance and process monitoring and control. 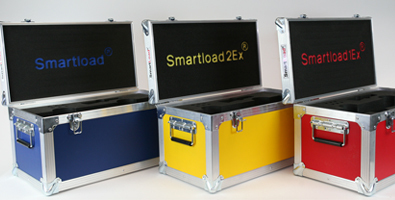 Scotload Ltd. (UK) - SmartLoad® is an innovative, intelligent load cell system that stores data for real time and retrospective analysis, providing asset owners with protection against potential misuse and overload events. SmartLoad® uniquely incorporates intelligence and memory directly on the load cell itself. Increasing functionality while enhancing the efficiency and safety of your lifting operations. SmartLoad® delivers a standard technology platform for use across a range of products including an ATEX approved version. Requiring only one handset to connect links, shackles and other load cells, it reduces operational costs. Fully compatible with existing equipment, SmartLoad® can also be retrofitted, removing the need for expensive full system upgrades. The load cell, handset firmware and software can be upgraded at any time via the internet as updates become available, making it an adaptable solution. Utilising the latest wireless technology for increased range and improved signal reliability, SmartLoad® provides assurance, improves data accuracy and enhances workplace safety as well as reducing downtime. 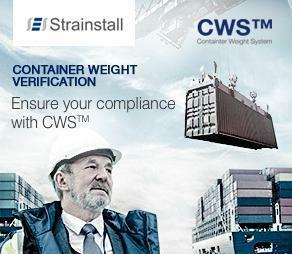 Strainstall UK Ltd. (UK) - The Container Weighing System (CWS)™ provides a verified gross mass (VGM) for container weights, as well as identifying eccentric loading conditions to support terminal operators with IMO SOLAS compliance. CWS™ is a highly accurate load measurement solution for container weighing, integrating load monitoring technology onto container handling equipment - with no delay to port operations - to provide a quick and easily retrofitted solution that delivers accurate weight verification data in real-time. The Container Weighing System™ can be installed and tested within a matter of hours and is fully configurable enabling operators to select the most appropriate option for their container handling needs. Container weighing system options are flexible including load pins or diaphragm load cells or standard industry Twistlocks. It can be installed in the spreader, headlock, sheaves or booms using our patented technology for use with reach stackers, rubber tyre gantry's (RTG), straddle carriers and gantry cranes. Successful trials for Strainstall's latest generation Container Weighing System (CWS)™ have been undertaken at some of Europe's largest container terminals, categoriacally proving that CWS™ exceeds even the most stringent industry accuracy expectations. The Container Weighing System™, trialled on a significant amount of lifts across a wide range of container weights, consistently delivered highly accurate verified gross mass (VGM) for containers. All trial results exceeded expectations for IMO state competent authority requirements for SOLAS. 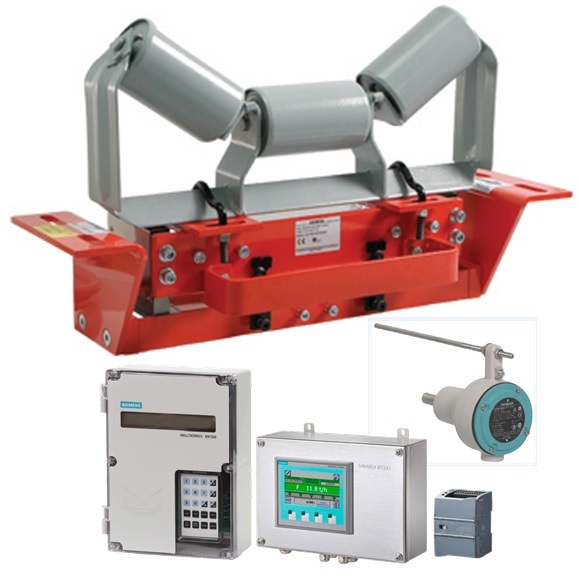 Siemens (Germany) - The new weighing module Siwarex WP251 is part of the SimaticS7-1200 Basic Controller family and seamlessly integrated into TIA-Portal. Siwarex WP251 controls dosing and batching tasks completely independent and fulfills the typical requirements of these processes, such as speed and accuracy. Operation and commissioning of the scale are quick and easy: due to the free software example application ""Ready-for-use Siwarex WP251” the commissioning, calibration and operation of the scale can be done completely via the CPU / Touchpanel – thanks to the WP251 function block without any additional programming! 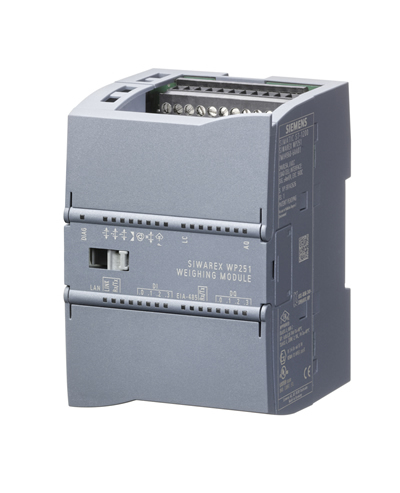 Additionally, Siwarex WP251 is very flexible in its usability: Integrated in Simatic S7-1200 all advantages of the automation system can be used: customer and application specific requirements can be added and programmed in the Simatic CPU easily. This offers a free programmable and flexible weighing solution by using Simatic standard components. Operated in stand-alone mode all parameters and functions can be accessed and edited via the on board Modbus RTU or Modbus TCP interfaces. In this case a PC or a Modbus-compatible user interface can be directly connected and used for operation. With the trace function it is possible to optimize the scale. The saved values and status information can be illustrated and analyzed with Siwatool V7 and Microsoft Excel. 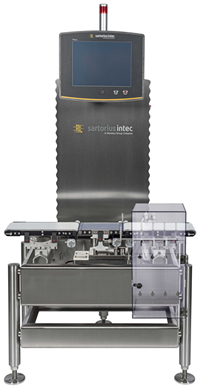 Sartorius Intec (Germany) - Checkweigher Flexus® for product quality and food safety. Sartorius Intec - With Flexus®, the high demands of the food industry have been consistently implemented in a checkweigher. With its wide range of configuration options, it meets practically every requirement. Product weight and integrity checking is an integral part of production control in the production of packaged food. At the same time, companies are also subject to the strictest hygiene standards, and it is precisely these requirements that the innovative checkweigher Flexus® was designed to meet. Flexus® offers minimised contact surfaces as well as horizontal surfaces, and the open frame has no hollow part. Together with the increased floor clearance, this means that Flexus® guarantees easy inspection as well as quick and safe cleaning, thus saving customers time and money. The focus was not just on hygienic design when Flexus® was being developed. On the additional premise of flexibility, Sartorius Intec was able to produce a hygienic, high-performance checkweigher that, much like a Swiss army knife, has a wide range of applications. This makes Flexus® an investment with real potential. The dynamic checkweigher handles quick transitioning between products thanks to a number of practical features. For example, additional modules can be attached to the sturdy construction's upper frame without difficulty and the width of the conveyor belts can be easily altered. There is also a comprehensive selection of separators and a wide range of data interfaces for seamless integration into any IT landscape. Various software options: separation monitoring, production monitoring, etc. Balanças Marques (Portugal) - The PCM M1500 is a modular construction weighbridge designed to weigh up to 80 tons, capable of withstanding the highest efforts resulting of carrying out the more demanding weight, with improved resistance to fatigue. The PCM M1500 is built with metallic or mixed (metal and concrete) modules standardized width of 1.5 meters, enabling platforms set up to 18 meters long and 3 meters wide, with two modules arranged side by side, occupying the entire width of the scale, which eliminates the use of directional louvers, thus allowing a perfectly safe circulation of vehicles. The PCM M1500 has a very reduced assembly time due to the great ease of module fitting and the minimum amount of necessary hardware. 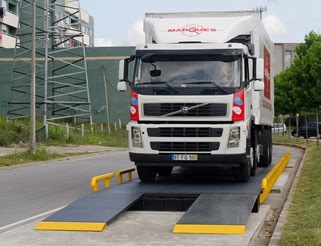 Because of its features and quality, the new weighbridge for weighing trucks Marques is synonymous of total guarantee of performance, accuracy, effectiveness, efficiency and durability. Installing a PCM M1500 takes less than a day. It has been developed so that it can be mounted easily with the use of few human and technical resources, through a fully modular factory prepared. The PCM M1500 has the advantage of being easily disassembled and transported for use at another location, with total use of the equipment. Balanças Marques guarantees its customers all the convenience and ease of not needing to hire other services following the acquisition of a PCM Marques, since Balanças Marques provides a full turnkey service. The PCM M1500 can be used in multiple locations and without related costs to construction or destruction of civil work, at least significant, and because it saves the customer from hiring other companies in other related services, such as the CE verification and legalization of equipment. 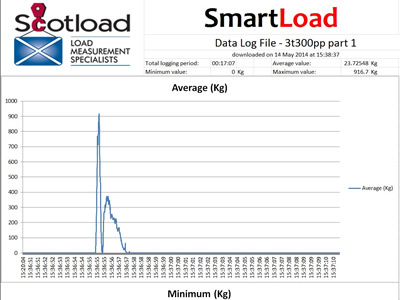 Scotload Ltd. (UK) - SmartLoad® software has been exclusively designed and created by Scotload Ltd to meet the needs of modern day load testing requirements and saves valuable operational time. Using the intelligent SmartLoad® technology, users can run the program, select a test mode and begin recording without any complicated set up issues. Results are automatically exported into Excel and intelligence is displayed in an easy to understand format for immediate sharing. The software can be upgraded at any time via the internet as updates become available, making it an adaptable solution. The intelligent SmartLoad® software automatically detects all load cells in range with no pairing required for instant display of results. Viewer: This entry level option enables PCs to be used like a handset and facilitates firmware upgrades to load cells and displays. Logging: Adds load monitoring data logging functionality to the viewer software and can view multiple load cells at once. Calibration: This option features the ability for operators to calibrate their equipment and reset overload events. Asset management: This advanced software package includes all functionality designed for full fleet management of your load monitoring equipment. Chatillon (USA) - The Chatillon 1300 Series autopsy scales are widely used in hospitals, laboratories, research centers and universities all over the world for demanding clinical applications. 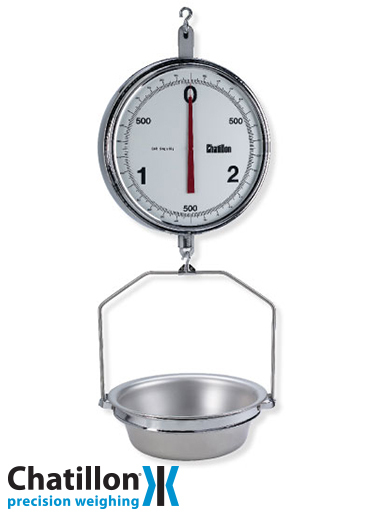 The 1300 Series autopsy scales come in the classic, elegant design that characterizes all Chatillon hanging scales. Due to its hanging features the Chatillon 1300 Series autopsy scales can be used in any environment. These mechanical medical scales do not require a table to stand on, nor electrical power. This, combined with the temperature compensated dual spring mechanism, makes the Chatillon 1300 Series autopsy scales ideal for use in hospitals in any part of the world regardless of the humid conditions or the size of the room it is used in. These autopsy scales feature a large 13 inch double dial with chrome-plated housing. For easy cleaning and protection of the dial, dials are glass-covered with one dial reading clockwise and the other counterclockwise. The dial features bold black numbers and graduations that are easy to read, along with a contrasting red pointer. Two brass dashpots ensure accurate, stable readings by eliminating oscillation. Stainless steel pinion and bronze rack combination ensure low friction performance even in elevated temperatures. The Chatillon 1300 Series autopsy scales offer accuracy down to +/-0.05% and enable a maximum overload of 120% of rated capacity and a tare capacity of 10% of full scale capacity. Full capacity comes in three dial revolutions and available scale capacities of 9 and 15 kg. The Chatillon 1300 Series autopsy scales include a holding loop and can be supplied with a bottom hook or a removable sanitary pan constructed of 300 Series stainless steel featuring drain holes per USDA specifications. The autopsy scales qualify as “Legal for Trade” in the US and conform to NIST handbook H44 Class III. IVM s.r.l. (Italy) - POWERVE (PSPR in italian language), is an innovative measurement system, fully portable, designed to measure the static weight force distribution loaded on track, by each rolling stock wheel. It can, in fact, measure the static weight force loaded by each wheel of each bogie of a railway rolling stock on the rail, interposing the sensitive elements only between the two wheel-rail running surfaces. This will take into account the effects due to possible differences in wheel diameter due to wear. Specific rising mechanical supports, leaning on the rails, allow the vertical translation, of a wheelset or of a bogie, by positioning it on the corresponding measuring zones, which are constituted by a pair of load cells for each wheel. These form a sort of “cradle” in which each wheel is self-centering in a stable equilibrium condition, that allows the rolling stock to remain still without having to apply an external constraint. The system is therefore not affected by tensions due for example to the braking forces. cIt requires less of 30 minutes of total time to perform the measurement of one bogie. POWERVE is equipped with a built-in software, which allows to manage the system through a tablet, which wirelessly receives the measured data from the acquisition systems. It is designed to support the operator during the procedure, providing guidance on the necessary actions to perform during the whole measurement cycle. It’s also equipped with control and visualization systems (both HW and SW), to control the measurement process, to display the results, to process data and store them. These features are aimed at limiting human errors and to guide the operator throughout the measurement process. Chatillon (USA) - The Erichsen 343 scales are high quality hydraulic gauges specially suited for the aircraft and aviation industries where the hydraulic gauges are used for force balancing, weighing and weight distribution. The Erichsen 343 hydraulic gauges for aircraft and aviation are made of stainless steel and are hermetically sealed into a closed circuit filled with hydraulic oil. The hydraulic gauges are easy to operate and do not require any power source. The large dial allows you to view loads from a distance. If the gauge needs to be viewed from a remote location an optional extended tube for the dial can be added. These hydraulic gauges come with a center thru hole enabling them to be used wherever there is a need to fit a centering adapter to secure the load being applied. The centering hole design allows for accurate load applications in both compression and tension applications. Unlike their electronic counterparts (load cells with digital indicators), the Erichsen 343 hydraulic gauges are immune to ESD (Electro Static Discharge) and transient voltages. Due to its rugged design the Erichsen 343 hydraulic gauges can operate in harsh environments where traditional hydraulic gauges give up. They come with a load range of 1 kN (220 lbs) to 2500 kN (560.000 lbs) and an accuracy of 1.6% of full scale. An optional digital indicator is available. The Erichsen 343 hydraulic gauges may also be used in additional applications such as hydraulic press, clamp force verification, continuous measurement of axial forces, to monitor bearing forces that arise on lathes, boring machines, extrusion presses and similar. 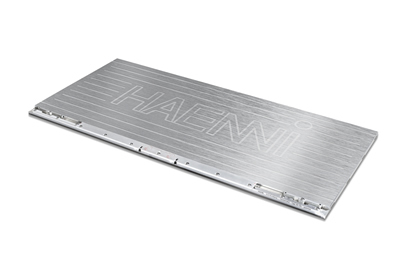 HAENNI Instruments Inc. (Switzerland) - The wheel load scale WL 104 for measuring wheel and axle loads on pneumatic tires at standstill or while driving up to 20 km/h. Unbeatable large active area, which allows to seamlessly string together several scales. From dynamic to static or pre-selection for legal weight controls, WL 104 has it all. Most modern fieldbus technology ensures fast and reliable data transfer to the evaluation unit. Certified to OIML R76 class IIII OIML R134 (site and country dedicated). Scale Weighing Systems LLC (USA) - The Scale Weighing Systems SWS-7620-3084-LCD, Digital Livestock / Floor Scale is a Heavy Duty Industrial scale constructed of rugged steel with tread plate surface and large platform, 96" Long x 30" Wide x 5" High with a 4" High Side Rail, The integrated 6" Long Ramps make it easier to get an animal on the weighing platform with ease. Adjustable Bal Capture leveling feet allow scale to work effectively on uneven floors. With a Standard capacity of 5000 lb x 1 lb (other capacities available), the SWS-7620 will accomodate most animals. The SWS-7620-3084-LCD features an Easy-to-read 1" Back-Lit LCD display with auto-zero, auto-tare, auto-reweigh, and Weight Hold feature. Remote electronic control console with Wall & Desk mount Bracket included. The 7620 is AC/DC and the Rechargeable battery ( aprox. 100 hrs )and 120V AC Adapter/Recharger are included. The SWS-7620-3084 Livestock / Floor Scale Indicator is completely Stainless Steel. Connected to the Mild Steel Platform with a 20` Steel Braided Cable allows the Display to be positioned away from the base without the worry of those pesky rodents chewing the cable. The SWS-7620` Motion sensing technology and lock-in weight feature gives you accurate weighing results even if the animal is moving during the weighing process. Easily assemble the SWS-7620 by placing it on a hard surface, adjust the foot pads to level, connect the indicator and turn on the power. No installation costs or moving parts that require maintenance or adjustment makes the scale economical to own. Marsden Weighing Group (UK) - The Smart Diet Scale is a complete diet control solution for slimmers, athletes, bodybuilders and those with medical conditions. It calculates the nutritional value of an entire meal, using four weighing separate weighing pads and transmitting the data via Bluetooth to a smartphone/tablet app. The app, compatible with both iOS and android devices, has over 550,000 food items pre-installed, and measures calories, carbohydrates, protein, fat, vitamins, sugar and more. The Smart Diet Scale has already gained interest from the English Institute of Sport - the team behind TeamGB - who took one sample (and later purchased a further two) for trials with nutritionists. It will also feature in the 'House of the Future' at the Ideal Home Show at London's Olympia next month. For more information about this article from Weighing Review click here. Other articles from Weighing Review.